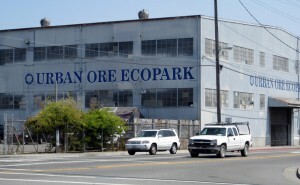 Ecopark Store | UrbanOre.com - If it can still be used, you can probably find it in our Berkeley, CA retail store. At our Ecopark Store you’ll find building materials, furniture, housewares, hardware, books, music, and much more. Shop for reusable products in our 3-acre facility with a 30,000-square-foot warehouse and outdoor sales floor. Come by and drop off what you have to recycle, sell, or just need to get out of your house. We even make house calls – so schedule a pick up today. Learn about Zero Waste planning with a personal tour for your class, group or delegation. Our Eco Park warehouse is easily visible from the street. You can't miss us! Our 3-acre facility is divided into two retail divisions – the General Store and the Building Materials Exchange (BMX). Each division sells and processes slightly different merchandise. At the right is a short list to give you a feel for what you’ll find in each. These retail stores are located under the same roof in eco-friendly Berkeley, CA, at 900 Murray St. Get directions or contact us if you need to know more about how to find us. We are open 7 days a week 360 days a year and close only on five major holidays. Check out the FAQs page for more details on hours of operation. For purchases we accept cash, MasterCard, Visa, American Express, and Urban Ore Trade Credits. If you are dropping off reusable goods, you may be compensated depending on the value of what you have to get rid of. Learn more on the Drop Off page. It’s hard to imagine this place until you actually see the scope of what’s here, but once you do, you’ll realize with a sudden shock how much stuff ends up in the garbage even though it can still be used for something. Most of what we sell would have gone to the landfill if we weren’t here. The Ecopark is also a good place to spend a rainy afternoon wandering the acres of random stuff and getting inspired for a new creative project. In fact, there is a lot we can show and tell you about Zero Waste planning in a tour of the Ecopark. If you want to set up a tour for your group, let us know and we’ll share how we plan To End the Age of Waste. For more information and details about what we sell, a map of the store, and last-chance discount information, see the Shop page. A lot of what we sell comes from people like you. For more information and details about what we receive, a map of the dropoff points, prices we pay (when we pay, which we don’t always), and requirements, see the Dropoff page. Urban Ore will pick up your unwanted reusable items from your home, office, business, or storage facility. For information and details about materials we pick up, areas we serve, compensation (if any) and requirements, see the Schedule Pick Up page and then give the Outside Trader department a call.